Even if you’re in the iPhone Upgrade Program, you might have an old iPhone languishing in a drawer somewhere unused. And if you buy your iPhone outright each year, you can usually recoup a good amount of that cost by selling the old model every time you upgrade. Here’s what you need to know about selling or trading in your old iPhone for top dollar. This probably goes without saying, but you’ll get the most money if your iPhone is in pristine shape. That means keeping it in a case to prevent bumps and dings to the corners. But if your phone shows some wear and tear, don’t worry—it’s still sellable, you’ll just get a little less. Keeping your original box, and including the charger and cable also helps you get the most money. Be sure to get all the data out of your old iPhone. A backup to iCloud or iTunes is the most convenient way to sync all the data to your new iPhone. But because an iPhone backup is pretty self-contained, I also like to separately make sure my photos are synced to Google Photos or Dropbox, and I also use an app for my Mac called iMazing that also lets me back up text messages, including all the photos and videos people have texted me that I never saved to my Camera Roll. Next, unpair your Apple Watch if applicable, by opening the Watch app on the phone, tapping the My Watch tab, tap the i button next to your watch, and tap Unpair Apple Watch. Sign out of your iCloud and iTunes accounts too. That’s at the top of the Settings app: Just tap your name, then scroll to the bottom of the next screen and tap Sign Out. If you’re switching from an iPhone to an Android phone for some bizarre reason, you also need to degregister your phone number from iMessage, by going to Settings > Messages and turning off the switch labeled iMessage. Securely wipe your old data with this option. Once you’re sure your iPhone is all backed up and ready to be fully erased, head to the Settings app and tap General > Reset. The nuclear option here is Erase All Content and Settings. You’ll be prompted to turn off Find My iPhone and sign out of iCloud, if you haven’t already—otherwise iOS’s Activation Lock will prevent the phone’s next owner from activating it. 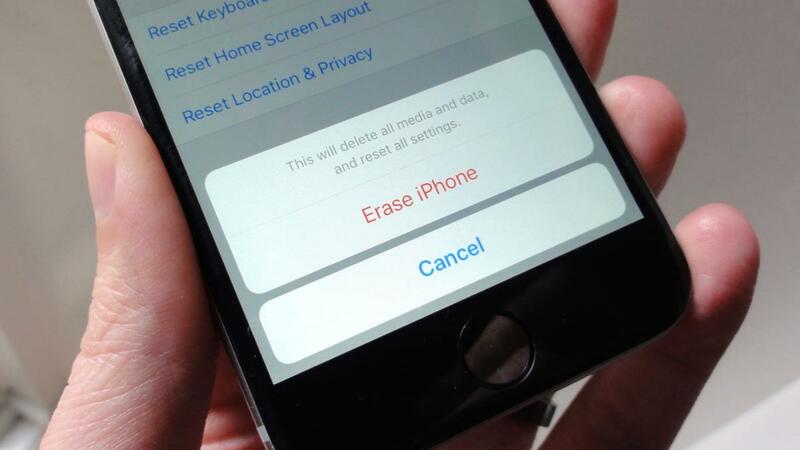 Confirm that you want to erase all the data, and your phone will be securely wiped and restored to factory settings. Where are you going to sell your iPhone? I like to start my research at the third-party buyback sites. You can get an idea there what your phone in its current condition is worth, and then either take that offer, or post your phone on Facebook or Instagram to see if a real-life friend wants to buy it—you’ll maximize your profit that way, and you’ll both feel more comfortable transacting with someone you know. If no one bites, there’s always Craigslist or eBay, or come back to one of these third-party buyback sites. After all, they offer an incredibly convenient experience, versus having to meet up with someone in the real world and transact in large amounts of cash. I have an iPhone 6s in good condition, so I got quotes from these sites, just to compare their offers. Your results will vary—prices fluctuate constantly based on the item’s condition as well as the sites’ current supply and demand. Gazelle. Gazelle buys and sells preowned smartphones, tablets, laptops, and other gadgets. They’ll give you an online quote for your item, and then send you a box to ship it to them for free. You can receive payment as a check, PayPal, or Amazon gift card. The offer is good for 30 days, and Gazelle will make you a new offer if the item is in worse condition than you described. If you decide not to take the new offer, they’ll send your gadget back, but you pay for the return shipping. Gazelle even has “ecoATM” locations nationwide where you can drop your device off for an instant payment. For my 64GB AT&T iPhone 6s in good condition, Gazelle offered me $150. Glyde. Glyde works a little differently. You list your item for sale—smartphones, tablets, laptops, iPods, even old videogames—kind of like you would on Facebook or Craigslist. But then Glyde then finds the buyer and handles the whole transaction. When your item sells, you’ll get a prepaid shipping kit from Glyde for sending the device to the buyer, and you can transfer the payment to your bank account or get a check. You can even get paid in Bitcoin. Glyde keeps 15 percent of the sale price, and insures the packages. If the buyer decides your device isn’t as it was described, they have 72 hours to return it, with return shipping costs split between the buyer and seller. 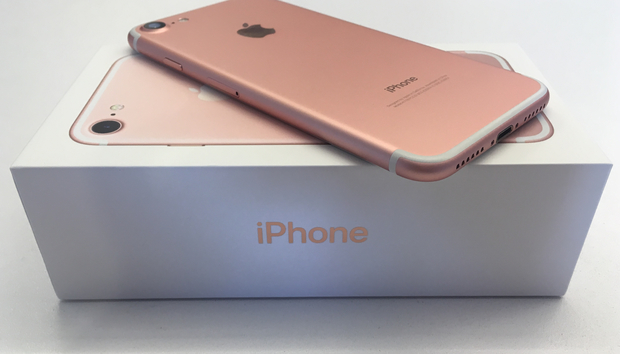 For my 64GB rose gold AT&T iPhone 6s, Glyde recommended a listing of $271, which would put $227.35 in my pocket. Swappa. Swappa also connects buyer and sellers directly, using PayPal for the transaction as well as its built-in protections for the buyer and the seller. Unlike Glyde, Swappa collects its fees from the buyer’s end, but the price the buyer actually sees has that fee as well as shipping included. The seller pays for shipping, and you’re on your own to package the item securely too. Sellers are also allowed to set their own return policies, but buyers can always return items that were received in worse condition than they were advertised. Swappa gives you a lot of data, and then lets you set the final price. 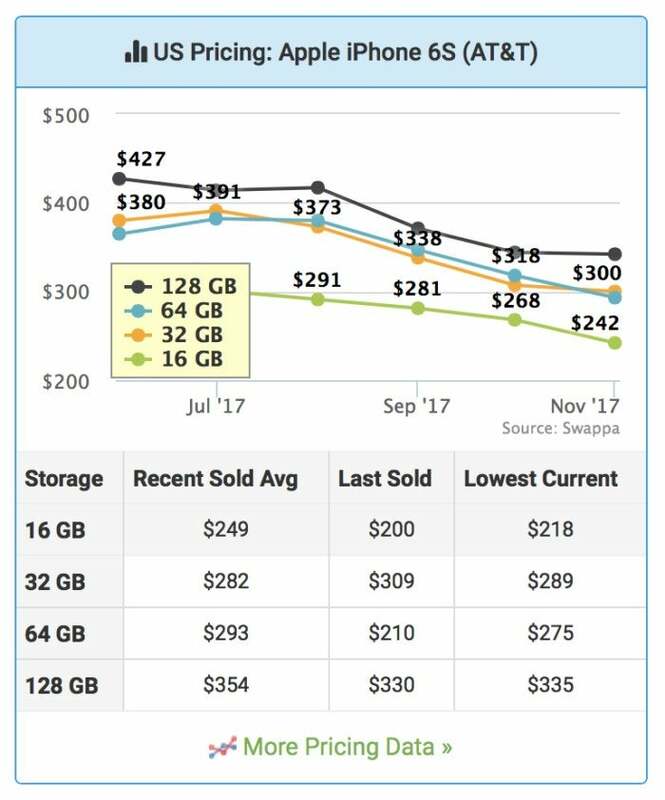 Swappa recommended I price my 64GB AT&T iPhone 6s at $218, which would net me $208, minus PayPal fees and shipping costs. The site reminded me to build shipping costs into my asking price, and it also provides data on the average asking price for that item, the price of the last sold item, and the lowest asking price currently on the site for that item. So I felt like I had plenty of info to make my own decision on how much to ask for. Another convenient approach is to turn in your old iPhone to the Apple store, Target, Best Buy, Walmart, or Amazon, where they’ll give you a gift card. You might not get quite as much, but these stores also take phones in worse condition than your typical buyer would expect. The big-box stores, for example, will give you a small gift card for an iPhone with a broken screen, while an Apple store will just recycle it for you. Again, I got quotes for my good-condition iPhone 6s (64GB, rose gold, AT&T), as well as an older iPhone 6 (64GB, space gray, AT&T). The iPhone 6 doesn’t actually have a broken screen—but I’ll pretend it does just to see how that affects the quote. Apple's trade-in prices are the worst of any place we checked, so be sure to shop around unless you're desperate for an Apple store gift card. Apple. The Apple store’s online quote service estimated I’d get a $200 gift card for my good-condition iPhone 6s. My theoretically broken-screen iPhone 6 would be recyled for free, but if the screen was intact, the gift card would be for $145. You can mail in your device for free to get a gift card, or bring it to an Apple store for an immediate credit toward a new device. Target. Target offers gift cards for your old smartphone, tablet, videogames, videogame console, wearables, smart speakers, and even other stores’ gift cards. They partner with CExchange, who will give you an estimate, provide a prepaid FedEx Ground label (you pack the device yourself), and then email you a gift card. Broken phones are acceptable too—for a broken iPhone 6, the estimate was $17.50. For my good-condition iPhone 6s, I was quoted $137.50. Best Buy. Best Buy is a good place to check if your phone is broken. For an iPhone 6 with a cracked screen, but still in working order, I was quoted $33. You can take a trade-in to a nearby store, which could be extremely convenient, or mail it in and receive a gift card by email. For my good-condition iPhone 6s, I could expect $180. No, I'm not trading in my replacement earbud tips. Amazon. Amazon is another must-visit if your iPhone is broken. It lets you trade in a wide variety of items for gift cards, and when you visit, it even shows you things you’ve bought from Amazon that are eligible—including, in my case, some replacement earbud tips. (Ew, Amazon. Gross.) Anyway, you can search for things you bought elsewhere, but it was harder to nail down the exact right SKU in Amazon’s vast listings. (It found 146 results for “iPhone 6,” for example.) 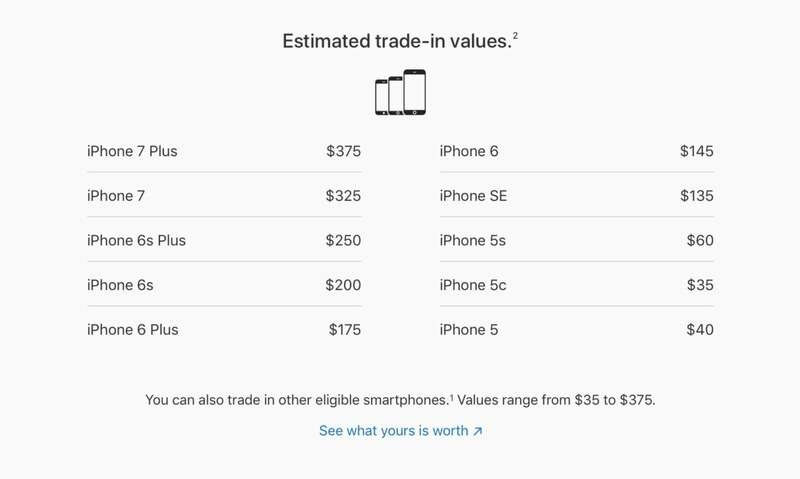 But the prices offered were good: $57.55 for a cracked-screen iPhone 6, $30.05 if that iPhone 6 won’t even turn on, and $170.05 for the good-condition iPhone 6s. Walmart. 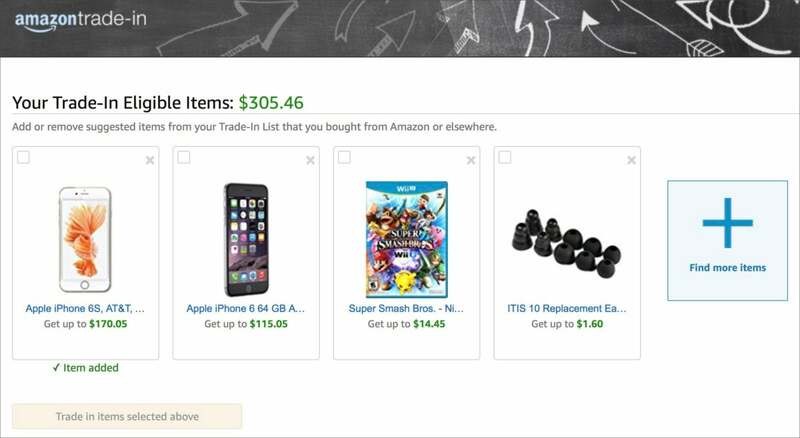 Walmart contracts with CExchange (like Target) to let you trade in smartphones, tablets, videogames, and MP3 players for Walmart gift cards. You get a prepaid FedEx Ground shipping label, but you have to pack the item yourself. Even broken phones can be worth a little something—I was quoted $15.05 for a broken iPhone 6 (64GB). My good-condition 64GB iPhone 6s would net me $185.91. Not to be outdone, your carrier will accept trade-ins too. If you cringe at your phone bill each month, unloading old devices to your carrier might be tempting, since you can use the credit for new devices or to pay your bill. Here’s what each of the big four are offering. I got quotes for a cracked-screen iPhone 6 (64GB, space gray, AT&T), and a good-condition iPhone 6s (64GB, rose gold, AT&T). AT&T. For AT&T’s trade-in program, you can bring your device to an AT&T Store to get instant credit, or get a quote online and receive a kit to mail your device in for free. Then you’ll get a promotional card in the mail you can use to credit your bill or buy new stuff—or you can choose to donate the value of the card to Cell Phone for Soldiers. For the cracked iPhone 6, I could get $38, and for the working iPhone 6s, I could get $160. Verizon. Verizon lets you trade in devices with a prepaid shipping box, or you can donate your device to HopeLine, which benefits victims of domestic violence. Credits can be applied to your bill, or you can opt for a gift card to use for new devices. Prices were the best of the big four: I could get $66 for the cracked iPhone 6, and $185 for the good-condition iPhone 6s. T-Mobile gives estimates without asking about the condition of the device, which doesn't bode well for accuracy. T-Mobile. T-Mobile’s trade-in program is a little strange. It doesn’t ask the condition of your device when giving you an estimate, and so it quoted me $82 for my iPhone 6. (But that would surely be reduced if I mailed it in with a cracked screen, right?) Plus, the site wants you to order your new phone or tablet first, then come back within 14 days to trade in your old device for a credit. T-Mobile’s quote for my good condition iPhone 6s was only $118. Sprint. Sprint’s Buyback program can be done in-store, for an instant credit you can use for a new phone, tablet, or accessory, or get as a credit on your phone bill. Or you can mail your device in for an account credit within 4 weeks. Sprint quoted me $60 for my cracked but functional iPhone 6, and a respectable $155 for my good-condition iPhone 6s. Check around! Selling via Glyde or Swappa will get you the most money because you’re selling directly to a buyer, but both services also make the transaction as convenient as possible. If you’re going the trade-in route for credit, check with your carrier as well as any big-box stores you shop in a lot and would love to have a gift card for. And keep in mind that the Apple store doesn’t pay very well compared to the rest, especially if your device isn’t in great condition.